The Mising community with its vibrant and colourful cultural heritage has been preserving their unique identity and practices for several centuries since their start of settlement on the banks of the Brahmaputra after migrating from the northern hills of Arunachal Pradesh. Over many centuries, the community has evolved their dance forms along with their other cultural practices. These dance forms have gained variety in different geographical areas of the Brahmaputra valley in Assam so far. The Mising dances vary from those performed in Dhakuakhana region from that of Disangmukh in Sivasagar district, of Majuli from that of Jonai and of Ghunasuti from that of Bokakhat in Golaghat district. 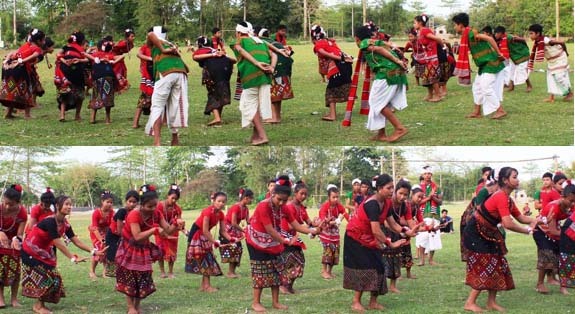 However, a concerted effort has been made by some dedicated youths from the riverine areas of the Brahmaputra in Tekeliphutaghat of Dhakuakhana sub-division of Lakhimpur district to bring all these dance forms to a uniformity to be performed as a single form of dance by holding workshops and practice sessions. A workshop of this kind was held before the Rongali Bihu this time. The workshop was organised by Abutani Ka:sim Ope:, a cultural organization based at Luitporia in Tekeliphutaghat where various forms of Mising Bihu dance like Lereli, Selloya and Gumrag So:nam were performed and tutored to make a uniform one. A final performance of the dance workshop was held at the playground of the Luitporiya High School on Tuesday where all the three forms of Mising Bihu dance were performed by the participants. “The workshop was the continuation of that effort which had become highly successful this time. The workshop brought together a large number of participants and audience on the second day of the Rongali Bihu celebrations in Dhakuakhana,” added Doley.